Below we outline six (6) critical fall furnace maintenance tips. Autumn has officially begun and winter is right around the corner. Although you may not be turning on your furnace just yet, the time is approaching quickly. 1. Clean your air vents and ducts. Your air vents and ducts must be clear in order to allow the warm air to flow from the furnace and into your home. Before you start using your furnace this season, use a vacuum cleaner with attachments to clean your air vents and ducts thoroughly. This is also a good time to make sure your air vents aren’t blocked by furniture or other household items, as this obstructs airflow and makes your furnace work harder to keep your home warm. 2. Clean the area around your furnace. Having items stored or sitting too close to your furnace poses a fire hazard. Before you turn your furnace on for the season, make sure to move all of these items out of the way. It’s especially important to keep certain highly flammable items, like paint, far away from your furnace at all times. 3. Check the exhaust flue. Your furnace’s exhaust flue is responsible for removing dangerous fumes from your home. If the flue is blocked, these fumes can build up inside your house, posing health risks. Make sure the outside exhaust flue is clear of any obstructions that may have developed since you last ran your furnace, such as branches, leaves or the nests of small animals. If you find anything blocking the flue, remove it before you need to use your furnace. When your air filter is dirty, your furnace won’t operate as efficiently as it could. In addition, an extremely dirty air filter can even lead to expensive emergency maintenance. If you haven’t replaced your air filter recently, replace it before the winter months begin. You should continue to replace this air filter at least every three months. If you haven’t had your furnace inspected recently, schedule annual maintenance before you start running the system for the winter. 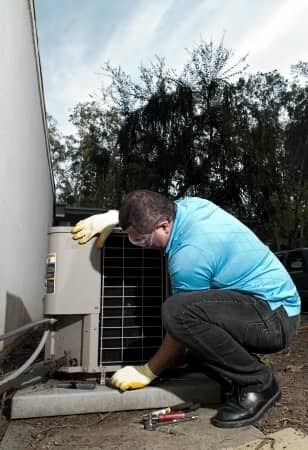 During your maintenance appointment, the Beckwith Heating & Cooling HVAC technician will check all aspects of your furnace’s operations, including the filter, gas lines and fan belt. The technician will also clean the furnace and make sure it’s operating properly. 6. Fix any problems with the furnace. If our HVAC technician discovers any problems with your furnace, fix these issues as soon as possible. If you don’t repair these problems now, you may find yourself without heat in the middle of winter, which usually means a longer wait time for repairs and a higher cost. To make sure your furnace is ready to handle this demanding season, call Beckwith Heating & Cooling today and schedule your Fall furnace maintenance inspection.